In winters, feet mostly stay cozy inside sock and shoes making us ignore them. Delhi winters are harsh and they can be bad for your feet as well. You might not be showing your feet around but it is best to take care of them for smooth, clean and happy feet. Here is how you can do this. Dead skin can accumulate on feet especially when they are inside shoes all day. Use a pumice stone and get rid of this dead skin every time while taking bath. Soak them in warm water with a little alum in it and scrub the heels, sides and toes with stone. Dirty feet not only look bad but they can be smelly as well. Keep them clean, wash them off daily and wear clean socks. Dirty feet and socks cause bacterial growth and you do not want that. Apply crack heel cream regularly. Using pumice stone is not possible all around feet. Instead, use a foot scrub to get rid of the dead skin. You can find them in the market or make one at home with easy DIYs. Use them daily while taking bath. We are habitual of moisturizing skin daily, why left out feet. Apply generous amount of moisturizer on them, giving a soothing massage. You can do it twice a day, keeping them soft and glowy. A pedicure now and then is great for your feet. Heel, toenails and sides need attention during winters. 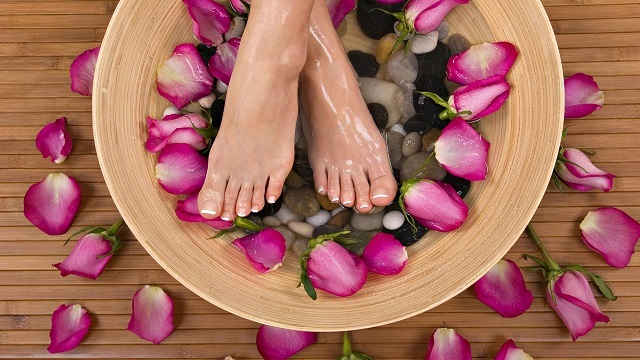 You can give yourself a comforting pedicure at home or go to spa for one. Do tend to the toenails carefully using clean pedicure brushes and tools. Wearing wrong size shoes can cause calluses, bruises and rashes on your feet. Avoid them all by wearing right size shoes with cotton socks.